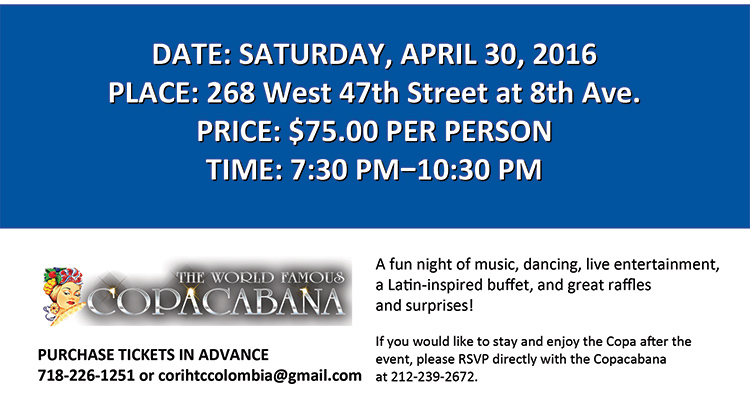 Even though our fundraiser at the Copacabana was a success, we still need funds for our work in Colombia. You can make a donation to support this year’s trip to Neiva, Colombia. Proceeds from this fundraiser will help defray the rising costs needed to support this vital medical mission. Anything you can do to help us raise money for this initiative is greatly appreciated. Last year, with the help of the Copacabana, we cleared over $30,000, and we hope to set a new record this year. Please help us to reach our goal. For more information, visit our website or fill out the enclosed form.